NEW BRITAIN - The Plainville boys soccer team has made history. For the first time ever, the Blue Devils are taking home the Class M state championship, defeating Ellington 1-0 Sunday evening at Veterans Stadium. After winning the most important game of the year, the Blue Devils were not seen celebrating on the field, but on the fence, surrounding themselves with the people who have been supporting them from day one. Before beating the No. 1 seed in the final, Plainville had to beat the No. 2 and 3 seeds previously. “You saw tonight we did deserve this win,” Plainville head coach Tim Brown said. Plainville controlled a majority of the possession in the first half. The Blue Devils were eager to score the first goal of the game, taking a total of 12 shots on goal, but were unsuccessful. The Knights were able to get a couple shots on goal, but could not make it past Blue Devils keeper Sergio Zaldivar. He made a number of crucial saves throughout the night and if it weren’t for him, Plainville may have had a different outcome. 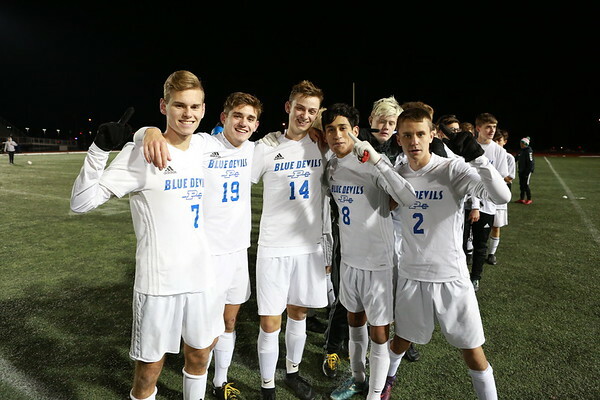 The Blue Devils knew they only needed one to win the game and with 11:50 left to go in the second half, on a pass from senior forward Dane Stephens, the game MVP, James Raucci found the back of the net for the Blue Devils. And Plainville did just that. The Blue Devils finish their Cinderella season 13-7-1, knocking off the top three seeds in the bracket in back-to-back-to-back matches; No. 2 Granby, No. 3 Stonington and now No. 1 Ellington. The team ended the year winning its last seven matches, going back to the end of the regular season, and seven of its last eight. Posted in New Britain Herald, Plainville on Sunday, 18 November 2018 21:20. Updated: Monday, 19 November 2018 09:26.